MRW looks at the details of the European Commission’s policy package on the circular economy and how UK and international organisations reacted to it. 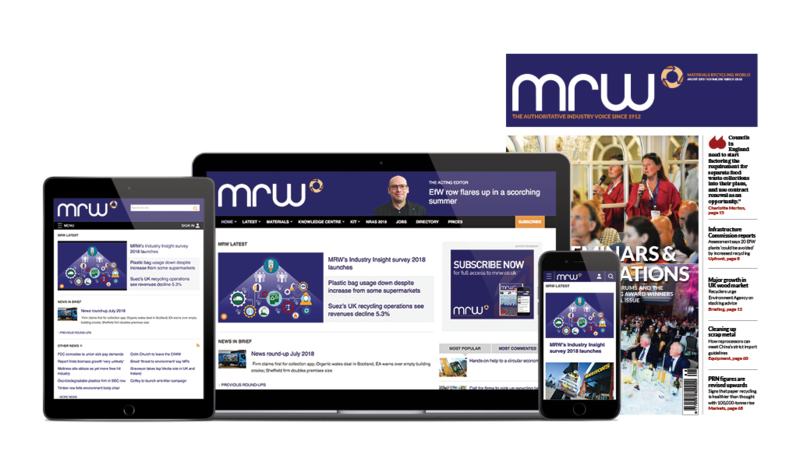 “Spotlight on Brussels.” That’s how one of MRW’s readers put it the week before the announcement of the European Commission’s policy package, which was arguably one of the most anticipated announcements by the waste and recycling industry this year. And it was possibly one of the most leaked, with details emerging days ahead of the official release, some disclosed by the European environment commissioner Janez Potoˇcnik himself. The adoption of the package is his last act before leaving the role in October. With it he launched a strong message: we should not be afraid of regulations. The communication is clear that there is a role for governments to play in the development of the circular economy in Europe. It argues that markets are important drivers of resource efficiency because materials and energy have become the principal input costs for many com-panies, but there are barriers that prevent the realisation of the full potential of the circular economy. For example, there is a lack of information, confidence and capacity for SMEs to move to circular economy solutions. And there is a scarcity of in- vestments in efficiency improvements and innovative business models because they are perceived as being risky and complex. Conventional consumer habits can also be seen to hinder new products and services development. “Such barriers tend to persist in a context where prices do not reflect the real costs of resource use to society, and where policy fails to provide strong and consistent signals for the transition to a circular economy,” said the Commission. The proposals are wide-ranging. Some are intended to set the ‘direction of travel’, to express Europe’s long-term commitment to the cause. Others are binding commitments for member states, notably higher recycling targets and landfill bans. Waste and recycling industry commentators responded positively to the release, and seem ready to roll up their sleeves to work on achieving the ambitious objectives (see below). Some took the occasion to reiterate a call for Defra to engage more with the industry and highlighted the differences among the devolved administrations. The initial response from Defra to the EU proposals was less enthusiastic, and included a sober remark that the measures might be expensive to implement. The department will further assess the proposals before coming up with a formal response, possibly looking at the findings of an inquiry on the circular economy recently concluded by the Environmental Audit Committee. The reaction by the Local Government Association to the announcement was even stronger, with it accusing the Commission of “loading responsibility” on councils. The Commission, however, made a compelling case for action (see numbers), which will be difficult for the UK to ignore. But let’s not forget that the proposals will now need to be assessed by the European Council and put to a vote in the European Parliament. It is only the start. MRW’s overview of the policy package is available here. Andrew Bird, chair of the Local Authority Recycling Advisory Committee: “If a similar approach to that of Wales and Scotland were adopted in England, there is no reason why councils should not be able to get close to the 70% figure. Mike Jones, chair of the Local Government Association’s environment and housing board: “Additional targets are not the most effective way to encourage this activity at local authority level, and could lead to increased costs at a time when public resources are stretched. “What is required is a continued development of partnership working between the suppliers, the recycling industry, the Government and local government. WRAP: “This is testament to the growing recognition of the importance of the circular economy to proofing business against future scarce resources. Defra: “We think the Commission’s proposals may have underplayed the potential costs to business, householders and local authorities, and will want to consider the impacts fully before we respond. Wales: Andy Rees, head of waste strategy for the Welsh Government, said a 70% recycling rates was achiev­able in Wales. The country was already achieving 52% recycling rates, ahead of the 2020 target. Ray Georgeson, chief executive at the Resource Association: “Elements of the proposals will be seen by some as too ambitious, but we do not share this view. Stretching targets and clear policy signals send the right message to the resources management industry. The Confederation of European Paper Industries, the EU non-ferrous metals industry association Eurometaux, Plastics Recyclers Europe and the Groupement Européen de l’Industrie de la Régénération (GEIR) all welcomed the Commission’s proposals on a progressive landfill ban on recyclable waste, on better reporting of data, on new requirements on waste exports, and on a link between innovation and ambitious recycling targets. More clarity was sought on the proposed definition of recycling, which they deemed too broad, and on end-of-waste status. They also encouraged the Commission to focus more on quality of recycling rather than quantity, and recommended EU-wide recycling and collection targets for waste oil.